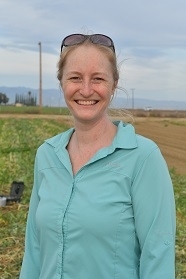 The UC ANR CASI (Conservation Agriculture Systems Innovation) Center hosted Dr. Shannon Cappellazzi, lead scientist for the Western US for two days of soil sampling at the long-term NRI Project in Five Points, CA March 18th and 19th. This well-known ANR study was started in 1999 and has been a unique research resource in the State because of its dedication to investigating reduced disturbance and biodiversity in food production systems. Since being established, it has maintained four experimental systems – standard tillage without a cover crop, standard tillage with a cover crop, no-tillage without a cover crop, and no-tillage with cover crop – and it has afforded comparisons of a long list of soil, crop, environmental, and economic outcomes that have resulted from each of these systems being implemented over such a long time frame. Earlier this year, the site was selected as one of the roughly 125 similar long-term studies in North America that the Soil Health Institute of Morrisville, NC is conducting in 2019. The goals of the monitoring program that is being done at each of these sites is to characterize and better understand how consistent, long-term management impacts a range of soil properties and functions and to also gain better understanding of which indicators of soil health might be best able to detect changes in performance and function across this broad array of environments. There is a great deal of attention these days to soil health and the need for dedicated care to maintaining and improving soil health. Many public agencies are behind these initiatives. There are however, few long-term study sites in California where the combination of the core principles that underlie soil health have been applied for long time frames. These principles include reducing disturbance of the soil, maintaining cover over the soil through the use of residues and cover crops, and accentuating diversity in crops and soil biology. In this regard, the NRI Project in Five Points has become a very valuable investigation of how the application of these principles may impact soil function and performance over the long haul. The Five Points effort involves the application of soil health principles to an annual cropping system that is common throughout the Valley. There are however, very few other places currently in the State where the combination of these practices is currently being implemented in a concerted manner.